The room was clean, we did have an issue getting in the front door with our code, but this was resolved quickly by staff. The room was cold when we arrived as the heating was not on, after the heating was switched on it did eventually heat up. It was comfortable and clean. The breakfast wasn't the greatest in my opinion, it would be great if there were more varieties of food. Also it was a bit turn off that it was far away from the center of the city, so had to walk half an hour to reach it, but it is okay. Otherwise satisfied. No frills for a fair price. You get what you pay for with Ibis Budget but unfortunately this often does not include a plug for the wash basin or a proper dropped kerb at the entrance to the car park. This latter is particularly irritating for the rider of a fully laden motorcycle. Due to road work , it was very difficult to find the hotel. The hotel itself was nice, basic infrastructure , nice bed . In short basic but fine. We were staying at Saint-Pourcain for the Ironman races at Vichy. The location was perfect for us at around 13 miles from Vichy which meant we were away from all the bustle of the race village. Excellent service and particularly warm welcome for me and my 2 dogs. Given room on ground floor and hotel set in safe enclosed grounds where they dogs could run free. Will definitely stay in this hotel again - Ibis chain is excellent in general but in particular for dog owners! 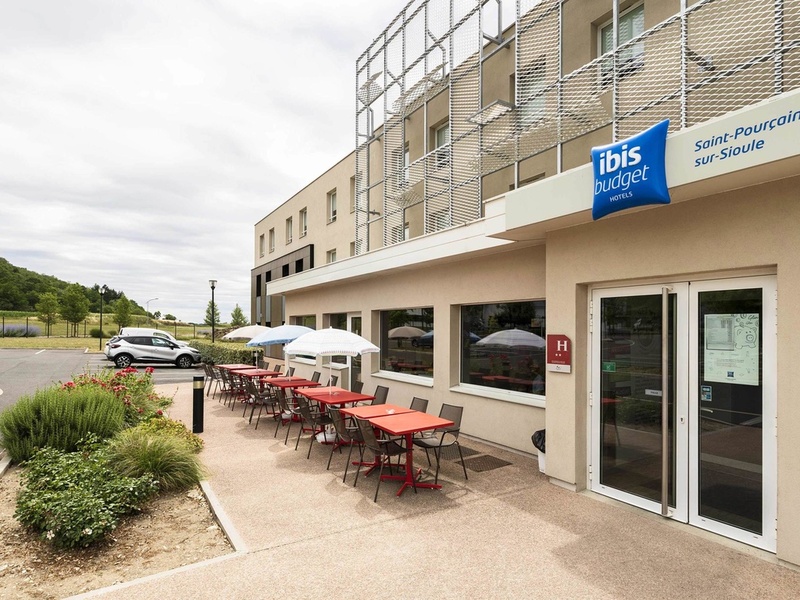 Nous vous remercions pour vos commentaires suite à votre séjour à Ibis Budget Saint Pourcain Sur Sioule. C’est avec grand plaisir que nous recevons vos compliments. Aussi, nous ne manquerons pas de partager vos appréciations avec toute notre équipe. Votre satisfaction est la plus belle récompense pour notre personnel qui travaille jour après jour pour vous offrir un service irréprochable. Dans l’attente de vous accueillir de nouveau, nous vous prions de croire, Madame/ Monsieur, en l’expression de nos sentiments les meilleurs. La direction. Good but I was surprised that receptionist could not even understand the numbers in English! Bonne situation, personnel agreable, disponible, proprete correcte. The staff were outstanding, friendly and helpful. I've never stayed in a Budget Ibis before so that was a bit of a new experience but it actually worked out fine. The room configuration was new to me. My only one problem was the lack of signage for the hotel before the town and in the town. Supermarkets have signs, I wish that hotels also had signs. Great and friendly reception; free baby bed upon request; clean room with all you need, and spacious enough; tranquil (room on parking side) and air conditioned. Clean. Good breakfast with excellent coffee. Overnight stop to visit the area. Nice welcome and helpful desk service, Room clean and spacious and comfortable and water nice and hot. Overall good experience but the 2nd bed was not done even though the room was booked for 3 people (2 adults + 1 kid). Always enjoy our stay, no complants,very satisfied.